Is Uber Charging Riders More & Paying Drivers Less? In recent months, Uber switched their method for pricing rides. In the past, riders would receive a price estimate for a ride. But the fare you paid at the end was determined based on the exact time and mileage of your ride. And the Uber driver would receive a percentage of this final fare. Now, instead of an estimate, Uber provides a guaranteed price for your ride upfront. But The Ride Share Guy notes this new method might be causing discrepancies for both riders and drivers. I’ll explain what’s going on with Uber’s upfront fares. What’s the Deal With Uber Upfront Fares? In the US and India, Uber now provides riders with a guaranteed price before requesting a ride. For example, I searched a sample UberX fare from Central Park to the Park Hyatt New York. Before requesting the ride, Uber guarantees the fare will be $10.52. The per minute and mile estimates can vary depending if Uber is in strong demand in a certain area. With this pricing model, Uber is essentially guessing at the time and distance for your ride. If your driver makes a wrong turn or there’s heavy traffic, your fare will NOT increase. But it’s possible your ride can take less time than Uber estimated. Or your driver might find a quicker route. In this case, your fare will NOT decrease. In the end, you’ll simply pay the guaranteed fare you saw before requesting the ride, regardless of the actual time and mileage. Of course, this assumes you only travel between the origin and requested destination. Personally, I like this method. Because the upfront price gives you the choice to explore alternatives, like a taxi, before requesting an Uber ride. The issue with the new fare method is the difference between what the rider is charged and the payout the driver receives. 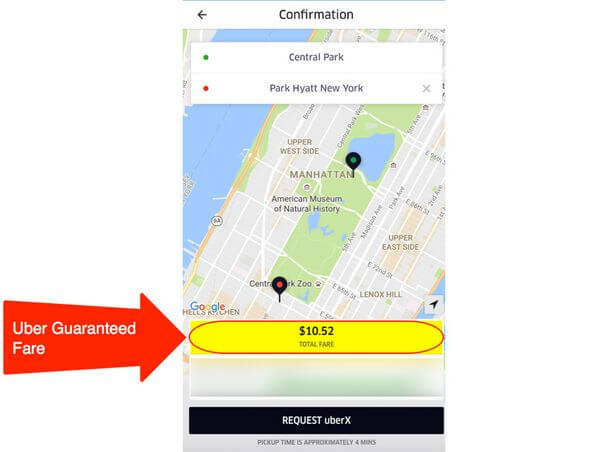 Based on examples from The Ride Share Guy, it appears Uber is charging riders based on the guaranteed fare. But then Uber pays the driver based on the actual time and distance for the ride. For example, UberX drivers in San Francisco receive 80% of the the total fare minus a $1.55 booking fee. So if Uber calculates a total driver fare of $10 based on the time and distance of a ride, a driver would receive a payout of ~$6.45 (80% of ($10 – $1.55 booking fee)). But what if the rider paid more than $10 based on the upfront guaranteed fare? Can Uber use 2 different fare calculations for riders and drivers? I looked at the Uber driver website, which appears to have contradictory information. For example, one page says the fare shown in the Uber driver’s app is the amount charged to the rider. But a different page says the fare the driver sees in the app may NOT be the exact fare paid by the rider. Uber hasn’t provided an official explanation on the fare discrepancies. But I’m optimistic this could just be a temporary situation given Uber recently changed the pricing model. I’m hopeful that Uber will continue to pay drivers based on a percentage of the actual fare paid by a rider. What Can You Do as an Uber Rider? 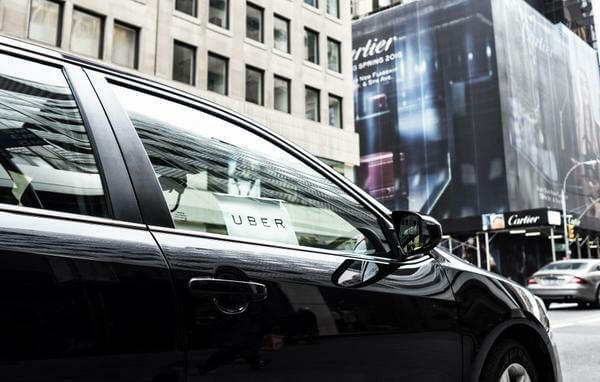 Uber riders and drivers can wait until the end of a ride to confirm the upfront guaranteed rider fare matches the fare shown on the driver’s app. Some folks say the driver app does not always instantly show the fare at the end of a ride. But drivers can politely ask the rider for the upfront rate they received before requesting the ride. Then, the driver can compare the fares at a later time. The fare issue seems to be more impactful for drivers. Because they might not be getting a payout based on the actual fare a rider is paying. If you don’t like Uber’s new pricing system and the potential discrepancies, you can always use alternatives like Lyft or a taxi. But I still think Uber is a convenient service. In my experience, Uber drivers are very friendly and their cars tend to be cleaner than taxis. With Uber’s new pricing model, there are fare discrepancies for riders and drivers. Riders pay a guaranteed fare based on an upfront estimate, which doesn’t change, even if there’s traffic or you take a longer route. But drivers are receiving a payout based on the actual time and distance of a trip, which might be less than what the rider paid. This means Uber is taking a larger percentage of the fare. Are you an Uber rider or driver? I’d like to hear your experience regarding any fare discrepancies in the comments! Rider just paid $84.19 and I got paid $41.79. I emailed and the continual app no reply. I am an uber driver in san francisco and just today i noticed uber is not paying drivers the full ride time. Example today i picked up a couple and when we got close to their destination the man says hes going to change the destination when we get a block away from the original destination because we will be dropping his girlfriend tje proceed to the new destination to drop him off. After getting home i checked that fare only to notice under ride details ( given to me by uber) the total trip took 43 minutes but uber only paid 34 minutes. So i started checking past fares and have noticed every fair is paid to the driver at less time then the ride actually took. In some of my fares there has been as much as 50% less time paid to me by uber than the ride took. I questioned uber about the ride from today and got an email response and i quote ” Thanks for getting in touch. We’ve reviewed the fare for this trip and can confirm the trip fare does fall within our estimate. Fares vary by city and are based on time and distance of a trip. Atleast for me its been every ride that ive looked at. If this is the case for every driver than uber has under paid drivers millions and millions all aroind the world. Class action suit maybe? I’m an Uber driver and noticed this discrepancy in the fare amounts. What happens in the case where the drivers fare is greater than the guaranteed fare provided to the rider? What amount does the driver receive? Yes, I have just started driving for Huber for not even a week and yet and realized already that they are not showing the full amount they charged the riders on the driver’s statement. They only showed less amount minus their fee. For example, tonight they charged the rider the amount of $9.82, however they showed on my account the fare cost was only $7.76 – 1.94 = 5.82. I followed the Uber’s Gps direction. There is nothing unusual happened during this driving. Also, I have talked to the riders and they told me that when you cancel a trip when a driver is there already, they charged them $5.00. However, a ride with a distance of 1 to, maybe 4 miles showed on my account they charged only $4 – $1.00 = $3.00. It does not make sense. They are scamming the drivers. Whre is the government? They should do something about this. It is not fair.